As y'all can see, there are some serious concerns about how Chris's case has been handled over the last 2 years. Having worked thoroughly on this case, as much as it pains me to say, she is right. I support her efforts to have an OCSO assigned. Blink,I know you have much respect for LE,and I try to. I support this mom 100%. I think you are 100% correct. I think at a very basic level, the Apopka Police are ill equipped to handle missing persons and homicide cases from a resource perspective. 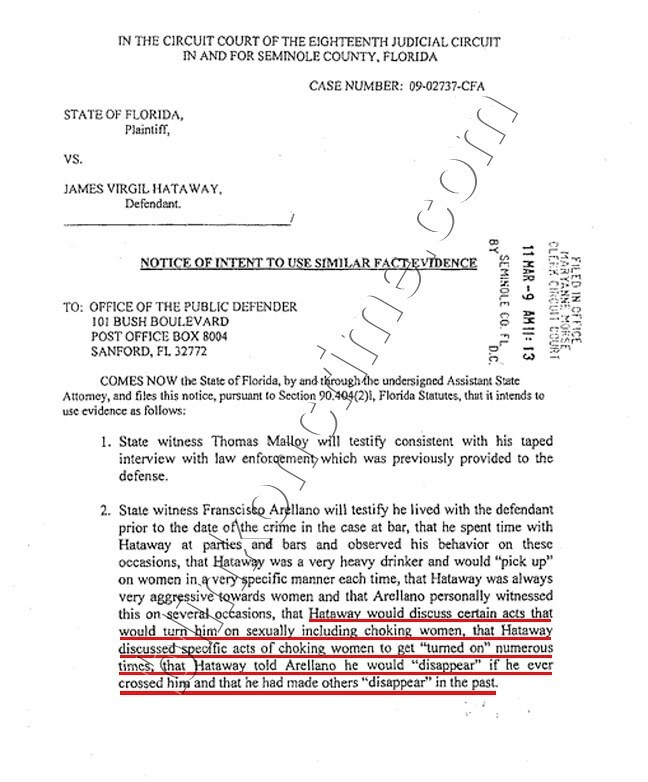 Almost exclusively, homicides in this jurisdiction are handled by OCSO, I think Rachael deserves a sound reason as to why Chris's case would not be as well, as she has requested but not received. The bottom line is that APD is responsible for correcting the mistakes they made in insuring a successful prosecution in this case, but they cannot turn back the clock, they must be dealt with. It really bothers me that a grieving Mother is feeling intimidated and frightened at these prospects interfering further in her son's case, that should not be. She just watched them dredge her child out of a marsh for 5 days. The same one searched a dozen times, and the same one he has been for 2 years. The family of Tracy Ocasio is hoping the discovery of human remains will bring them closer to finding their daughter. APOPKA, Fla. -- Police took WFTV back to a drained Apopka lake Friday to show how they're digging for the bones of missing man Christopher George, and they found more than just bones in Lake Carter off Ocoee-Apopka Road. Friday was the fifth day of searching, and investigators found another shoe that most likely belonged to George. Thursday, George's mother had harsh words for possible suspect James Hataway, but Friday said her son could've been high and just drowned in the lake. The circumstances of his disappearance are still a mystery. Fifty crime scene investigators from Orange, Seminole, Lake and Polk counties and FDLE are removing buckets of mud one-by-one from the lake bed and sifting through it using quarter-inch screens to make sure no evidence is missed. "We take that bottom layer of muck, about four to six inches depending on where we're at, maybe a little deeper, and then that muck material is placed onto screens," Apopka Deputy Chief Donald Heston said. APOPKA, Fla. -- After searching all week, Apopka police recovered more bones and a shoe they believe may belong to a missing man. Chris George's mother sat with the Apopka Police Chief Friday as crime scene investigators continued searching Lake Carter for remains believed to be her son, who vanished two years ago. The chief of police took her down to the site where a large number of bones were collected. Rachael said she talked with him about adding one more member to this team out here -- an Orange County Sheriff's investigator. Rachael said she's unhappy with how the investigation has been handled since her son was reported missing two years ago. But she said she's being ignored. "You guys keep doing your job," Rachael said. "Just bring one more set of fresh eyes that's never been on this before. Orange County, which is what county it's in. Bring them to the scene right now and have them start working side-by-side with you." Apopka police said there are nearly a dozen agencies from Polk, Osceola and Lake counties helping. Rachael also said she doesn't think James Hataway killed her son. "Someone killed Chris," Rachael said. "I firmly don't believe it is Jimmy Hataway, who is behind bars. And that someone is sharing our streets and who knows who's next. I have no clue. Someone is out there who killed my son." Hataway has been a person of interest in this case as well as another missing persons case in Ocoee. Rachael told News 13 though she does think Hataway is involved. The discovery of human remains and other evidence at an Apopka lake on Thursday will likely lead to some closure for the family of Christopher George. George's ID was found inside a wallet at the lake, but the family of Tracy Ocasio is still seeking some answers. Ocasio disappeared three months after George in 2009. The person of interest in both investigations is James Hataway. After investigators with the Apopka Police Department announced they found remains they believe belong to George, the mother of Tracy Ocasio said she hopes searchers will also find her daughter. Crime scene investigators pick up work again Monday at Carter Lake in Apopka where human remains were found and are believed to be that of Chris George, a man who vanished more than two years ago. Search for human remains at Apopka's Lake Carter could end as soon as today, police said. Apopka police are out at Lake Carter again today searching for more bones on the dried out lake bottom. The search, which has been scaled back dramatically since last week, could end today. Cadaver dogs were brought out to the area near State Road 429 near Keene and Ocoee-Apopka roads this morning in an effort to locate more human remains. Defense attorney Jeff Leukel wants a large pool because of he's concerned about Hataway's ability to get a fair trial in Central Florida, given all the media attention from the Tracy Ocasio case. SANFORD – Attorneys today asked a judge to bring to court a huge number of potential jurors — 100 — when attempted-murder suspect James Hataway goes on trial, something now scheduled for March 28. That's because Hataway 30, is suspected in another case, a high-profile disappearance, that of Tracy Ocasio, who's been missing for two years. SANFORD — James Hataway, the suspect in one woman's disappearance who faces trial in an attack on another, told a friend that he is sexually aroused by choking women, according to a new court document. Hataway, 30, is in the Seminole County Jail, awaiting trial on an attempted murder charge. Prosecutors last week disclosed a new witness — Francisco Arellano, a man they described as Hataway's former roommate. Arellano told prosecutors that he went with Hataway to parties and bars and watched him pick up women. Hataway would drink heavily, Arellano told prosecutors, and used the same pickup lines. He was "very aggressive" toward women, Arellano said, and later, Hataway would talk about "certain acts that would turn him on sexually, including choking women," according to the document. Tracy's family are enduring the most horrible thoughts, my continued prayers for all of Tracy's loved ones. SANFORD, Fla. -- A witness is expected to testify that James Hataway became aroused when choking women, according to a newly released court document. SEMINOLE COUNTY, Fla. -- A new witness is making some damaging comments about a James Hataway, who is accused of trying to kill a woman. Hataway is also the only person of interest in the cases of two other people who are missing. The witness said Hataway enjoyed attacking women. Francisco Arellano told the State Attorney's Office a similar story to the one he shared with WFTV in 2009. However, he was just disclosed as a state witness last week, which isn't sitting too well with the defense. Page created in 6.196 seconds with 21 queries.